It is always a pleasure to be simply able to stroll across the University car park to the Stirling Court Hotel (formerly the Stirling Management Centre) in order to present at an industry conference. Last Wednesday the Scottish Grocers Federation and Scottish Local Retailer hosted a half day conference there on Retailing in a Challenging Environment. There were two main parts of the conference – very well attended by independent retailers and suppliers. First, four retailers reflected on their case histories of the impact of new competing multiple stores on their businesses and the ways in which they have been, and are, responding. This formed the bulk of the conference. Secondly, my role was to present some emerging thoughts on what has been (perhaps incorrectly) described as the ‘local multiplier’ effect. We all know it is a competitive environment in food and convenience retailing. Retailers are not unused to competition, though the form of it is changing. Through these four case studies and examples, the conference explored some of the issues around meeting new competition. In Hawick (Kathryn McCusker) and Broadway, Edinburgh (Linda Williams) the new kid on the block was Aldi. Aberdeen (Graeme Knowles) and Bellshill (Abdul Majid on the other hand are facing Tesco. Be aware and prepared for the possibilities of competition entering your space – don’t be complacent. Stay on top of possible developments in the local area and don’t be afraid to challenge. Build your friends and networks, whether other good retailers to learn from, local connections or possible political allies such as MSPs, MP and local councillors, as well as your customers and local community. Make sure the great work you are doing is recognised and people understand your community role and impact. If you need to make changes to your business, don’t delay and wait until the competition has arrived and had an impact – good ideas to develop your store are just that, good ideas. On their own, these steps don’t stop the competition or kill a planning application, but they help to minimize the effects and maximize the positive perception of the local convenience store perception and its potential. My presentation (overheads available here) reported on ‘proof of concept’ sample research for the SGF. 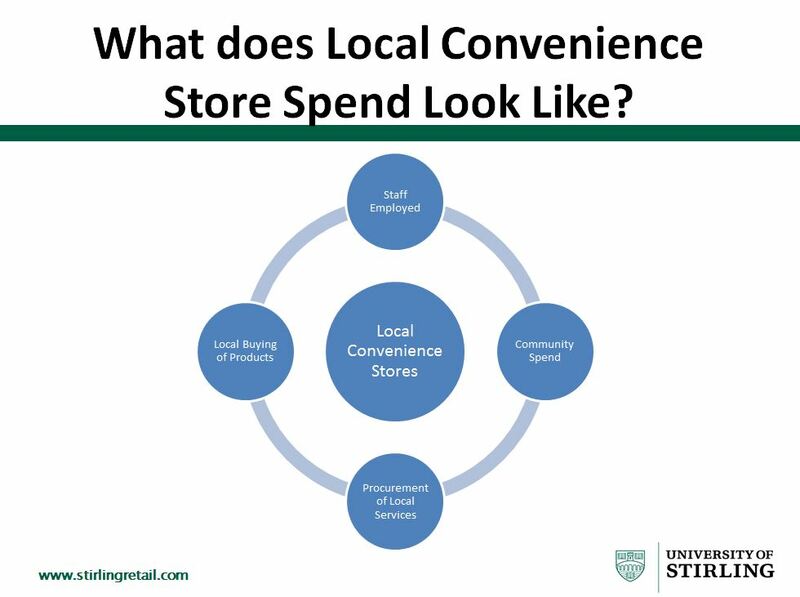 Local convenience stores are different to multiple retailers in their local embededdness and we need to understand the economic and social dimensions of this. Local convenience stores buy local products, pay local staff, purchase local services and engage in extensive local community engagement. Our project is intended to both quantify and qualify these dimensions of localness. The initial results I presented from eight stores sought to discuss and clarify the boundaries of these dimensions and categorise fully to many potential engagements. The figures in their own right are of interest as well. Some interesting additional points emerged in discussion and the scope of the services/products mix will be amended. 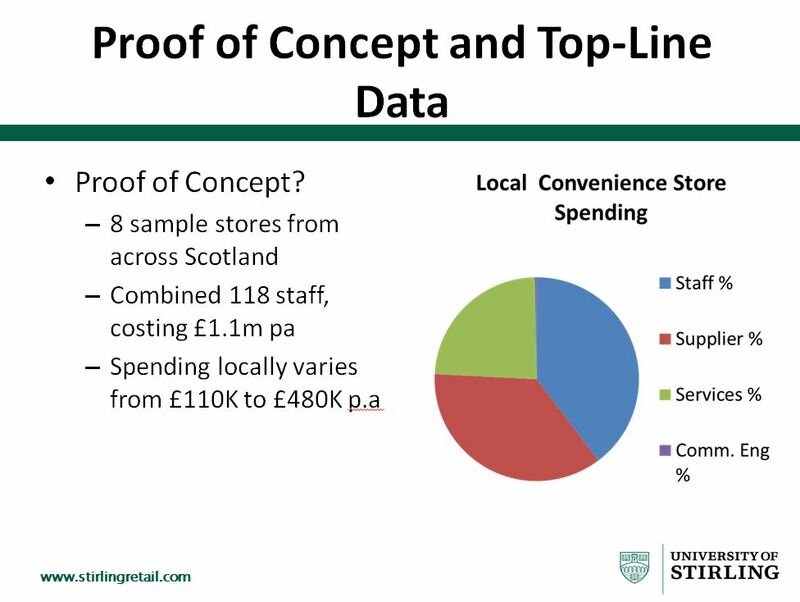 Once this is finalized a survey of local convenience stores in Scotland will be launched to fully understand this localness, both in quantity and quality terms. For example it is not just about the number of local jobs but the types of contracts and the quality (in work/life balance) of the jobs and experience that matters. The aim is to understand and present the various dimensions of the so-called ‘local multiplier’, and to get beyond simply producing numbers, as dramatic as they can be for some stores (and as much of a surprise to politicians they can be). Watch this space. Ably chaired by Anthony Begley, SLR Magazine, the conference was one of the last events for the outgoing CEO of SGF, John Drummond. Fulsome praise was given to John for contribution over the years to SGF and Scotland, as were best wishes and good luck to his successor Pete Cheema. This entry was posted in Community Grocer, Competition, Convenience stores, Food Retailing, Independents, Local Multiplier, Local Retailers, MSPs, Planning, Scottish Grocers Federation, Scottish Local Retailer, Small Shops and tagged Community, Competition, Convenience stores, Embeddedness, Local Multiplier, Local Retailers, Scottish Grocers Federation, Scottish Local Retailer. Bookmark the permalink.